I’m just going to start out by saying, this will probably be the least viewed blog post ever! Or maybe it will tie with my Super Random Secret Trick post :) That was a bit lack luster, but I thought it was pretty clever and shareable! I had to do this post for accountability, to keep myself on track, and it did just that. I went out early before work, during lunch breaks, and after work just to get it done by today…and secretly – the paint is still a little tacky. First I cleaned the chair. I used a stiff bristle brush to get in the caning and the corners. Then I lightly sanded. Just enough to get rid of the light gloss and give it a slightly rougher finish for the primer to stick. Then I wiped it down to get rid of the dust. 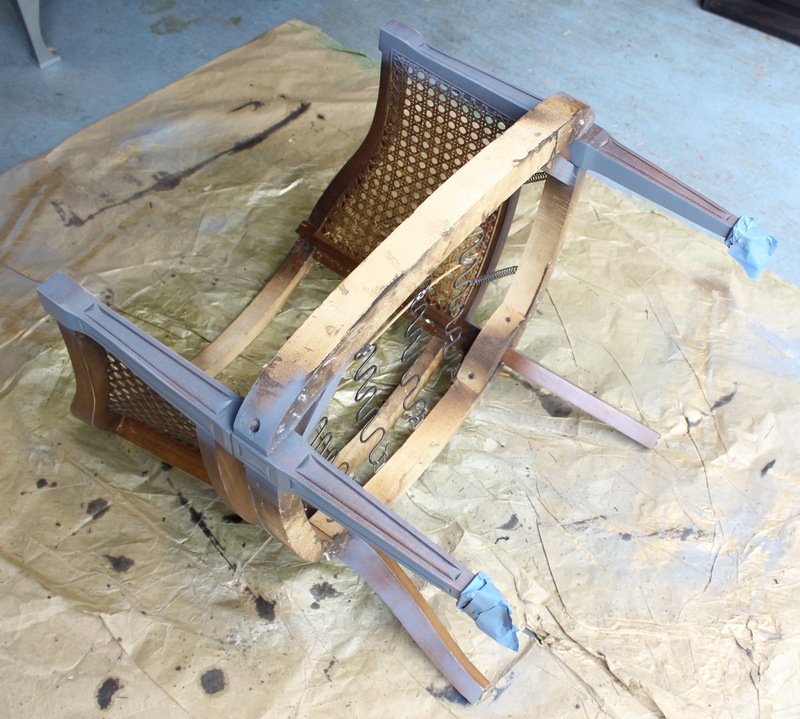 I taped up the casters and started priming. I used a spray because of the caning. 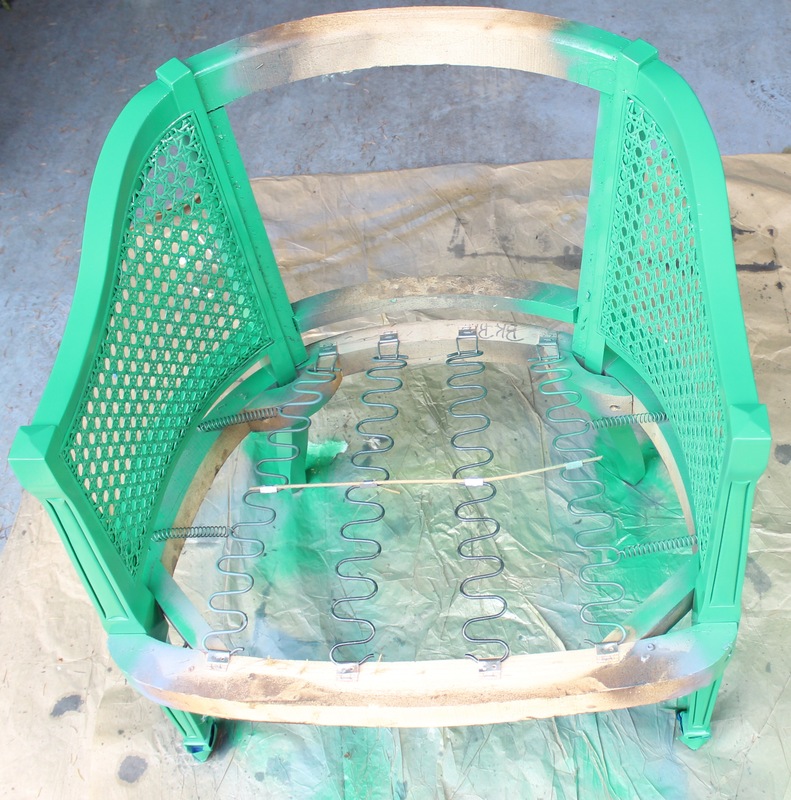 The spray does lighter coats than a brush and can get into all the little over-under spots in the weave. 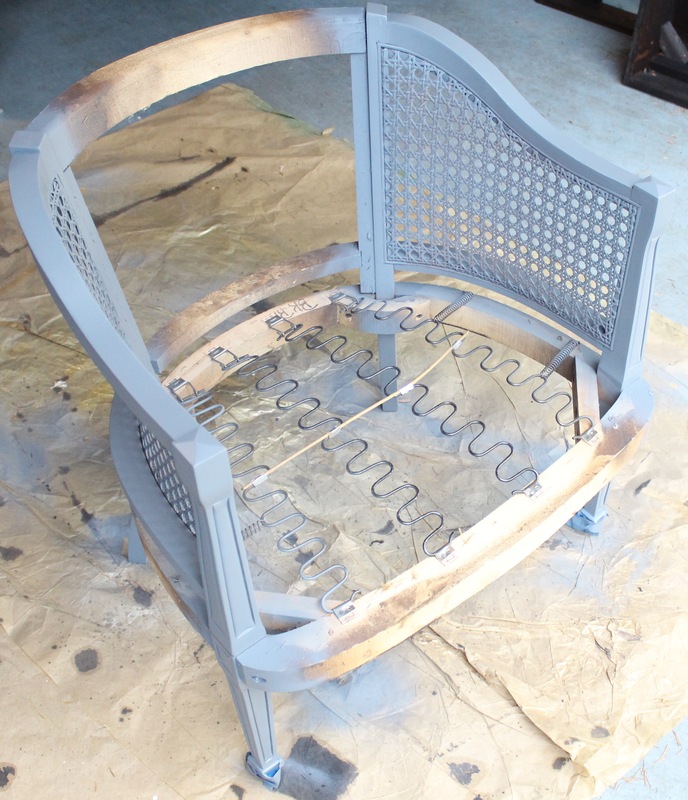 I left that to dry for a few days then did a light sand, but not enough to take off the primer. 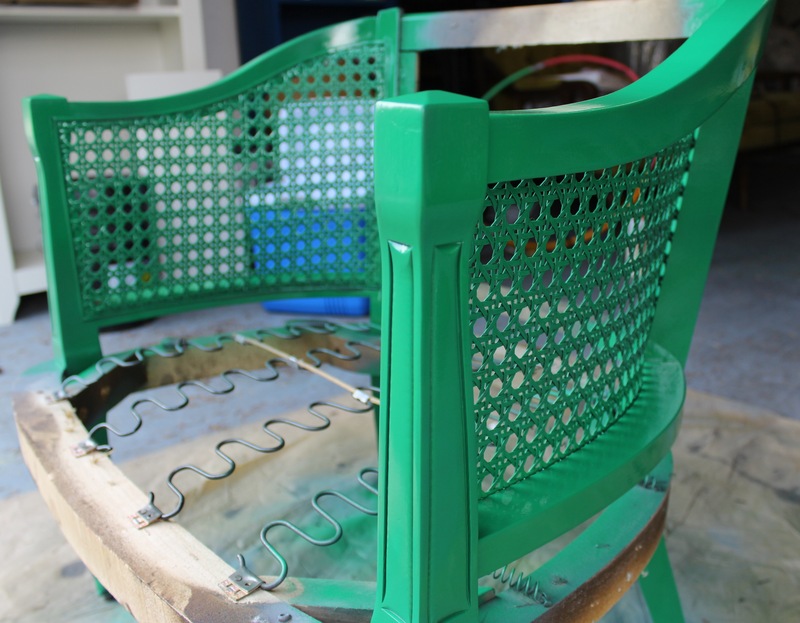 Then I just went for it with the Meadow Green paint. I’ll be honest, I almost stopped after I painted the first leg to rethink my color choice. I was slightly surprised by the brightness of the color. I love bright and bold colors in pictures, but I have a fear of doing them myself. I think it’s an insecurity, I always doubt I can pull them off…but I’m going for it this time! 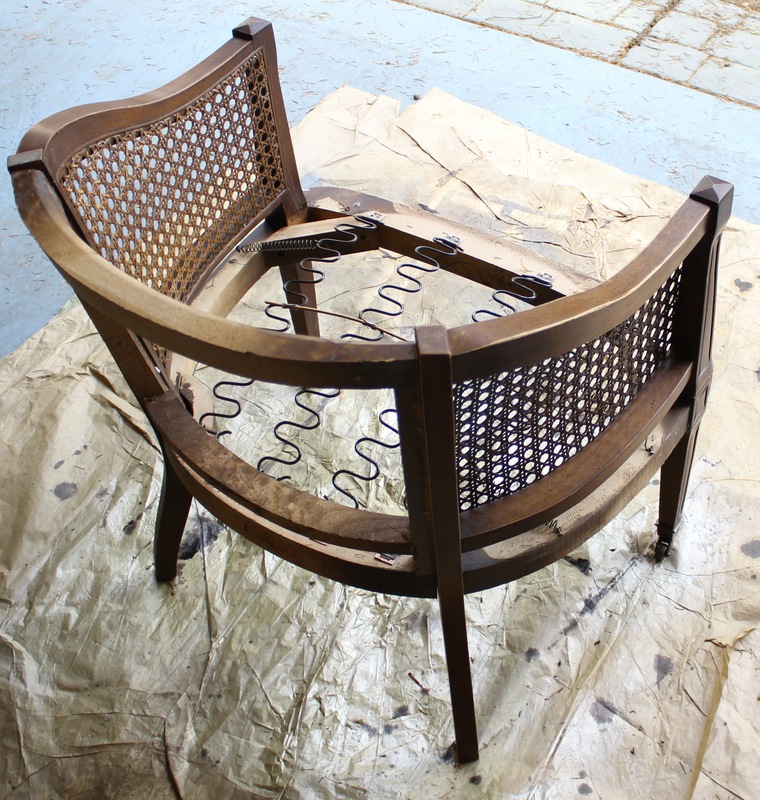 Over the next few weeks, I am going to strip and paint the other chair so that I can upholster them at the same time. With the Holidays, a vacation, and a big 30th birthday (not mine) coming up in next 3 weeks, it’s probably going to be pushed into December. But I’ll have other things to post, I’m sure! I like this… I wam interested in the final look! I know…I know! :) They are in the garage all ready to go. I have the fabric and the foam. I just need to DO IT! Thanks for keeping me accountable, that’s part of the reason I started blogging :) I promise, I’ll finish up soon! I was wondering if you ever posted the final phases of this project? 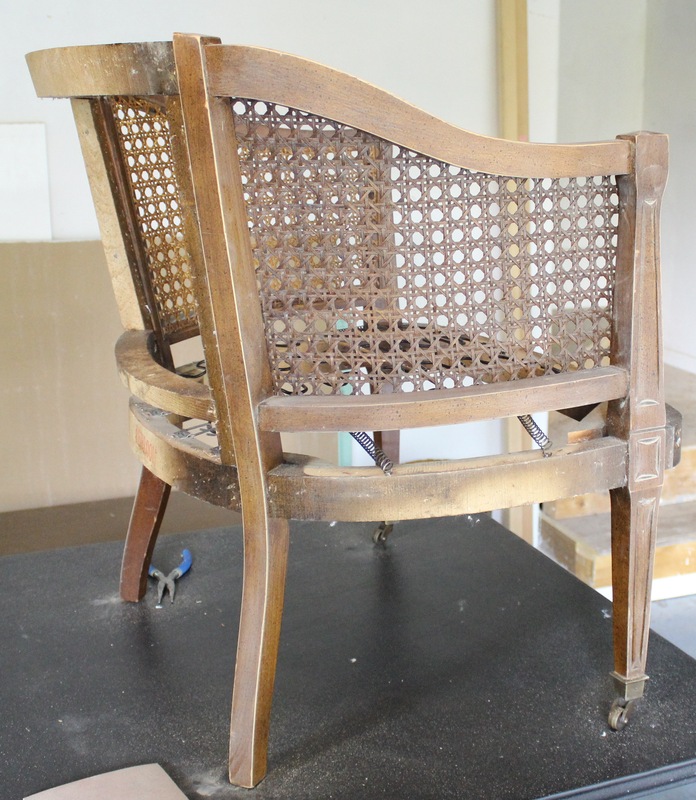 I am reupholstering an identical chair (first time recovering a chair) and I would love to read your tutorial! I am super sad to report – I ended up giving them away without finishing them. How much of a failure am I?! They just sat in the garage, and with a new little baby, I can’t get anything accomplished, and have a friend that is doing upholstery.